Pricing projects can feel tricky, but it doesn’t have to be. Dan Mall explains how to earn more, by understanding what goes into a price (and why hourly rates don’t work) and what your clients really want—and are willing to pay for. Learn the right questions to ask and when, and ways to turn client requirements into numbers, with a real-world example from Dan’s agency. Whether you’re running a shop or going solo, this is a book you can’t afford to miss. Love what you do? There’s a good chance you undervalue the impact of that work. Understanding the value your work drives is a completely separate issue from the cost of doing something. This book reminds you that you should understand both sides of that equation; it’s a breath of fresh air. 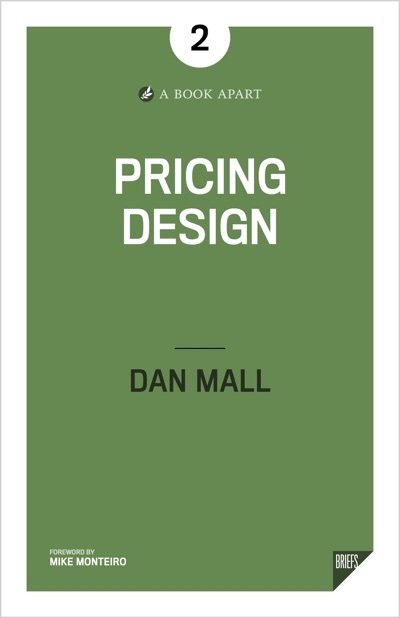 Everyone knows pricing design is hard, yet few books exist that teach you how to handle it and deal with different client needs. Dan shows you how to think about and value your work—and feel confident enough to communicate that value to your clients. What you have in your hands isn't a book, it's an intervention. Whether you're just starting your creative firm or have been in the business for years, Pricing Design will help you capture the value you provide to your clients. Even if you’re set in your ways in how you charge for your services, you’ll find new ideas that add value to any pricing methodology. Dan Mall is a creative director and advisor from Philly. He’s the director of SuperFriendly, a design collaborative that brings exquisite creative direction and design to the world’s most important and interesting organizations. Dan is an enthralled husband and dad, and cofounded Typedia (an encyclopedia for typefaces) and Businessology (a podcast and workshop series teaching designers how to run better businesses). He writes about design and other issues on Twitter and on his industry-recognized site, danielmall.com.